Organisation: Just a area of 20x20, 12 players split into 2 teams, 6 either side. 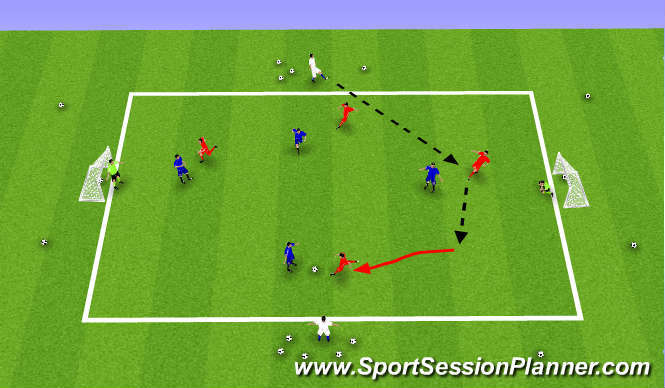 Players are to dribble through cones, and when they come to the pole in center of area, drop the shoulder and make the pass to team mate on opposite side, can progress this to make player use their other foot, do step overs or any trick when they come to the pole in the center. Always make it clear what side you want players to drop their shoulder to avoid collision. 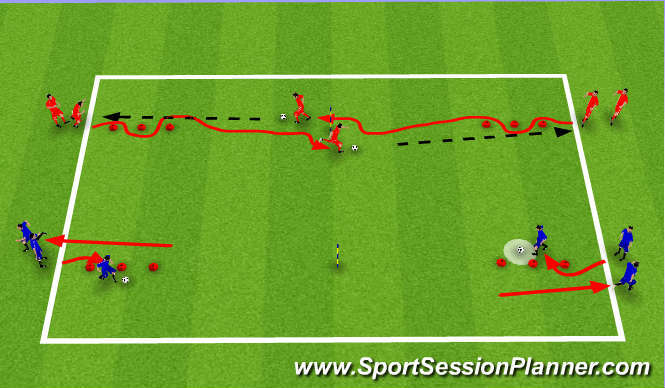 Key Factors: Close ball control, Agility, change of pace, first touch, head up. Organisation: Set up a pitch 50x25, this is a 4v4 with 2 floaters, restriction is floaters can only pass backwards and when a ball goes out they feed another in ruling out corners, goal kicks and throw ins, this will keep a fast tempo. Could progress game to only sideway and backwards passing in final 2/3s, therefore the player would have to carry ball forward.